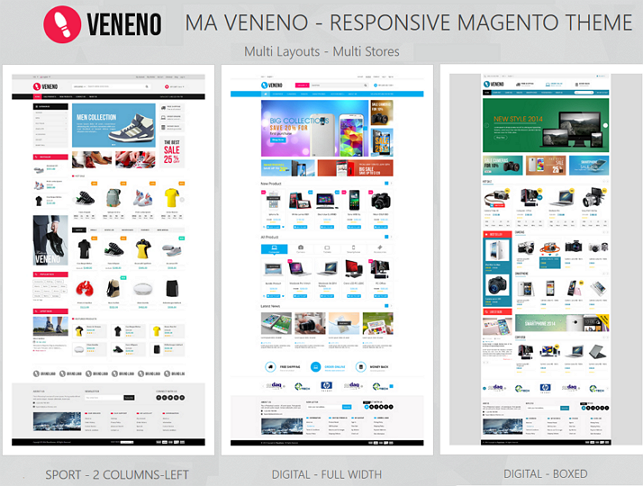 Veneno Magento Themes using best extensions to become more beautiful and more attractive: Banner sequence (Slideshow) extension with texts, images and nice effect; mega menu with many multiple columns styles or smart labels make it easy to advertise to customers the latest information about your products and you can add links to new products page, discount products in Mega Menu. ; Layered navigation Ajax, Ajaxcart super extension will save space the eCommerce shop, your customers can easily purchase and payment. Home page will constantly be updated the important information to attract customers as the best selling products with Bestseller Product Vertical Scroller Extension, new products, promotional information with Price Countdown extension. You can communicate with customer through Blog. Many static blocks with nice images and Brand Slider extension advertisement information to customers. 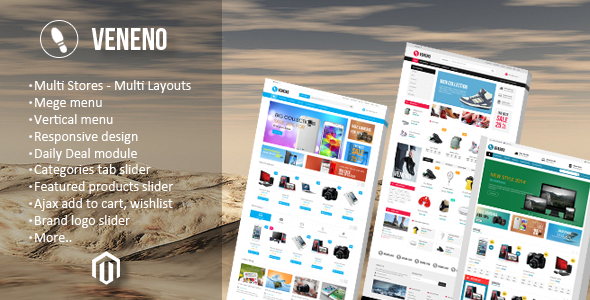 Item Reviewed: Veneno Multipurpose Responsive Magento Theme 9 out of 10 based on 10 ratings. 9 user reviews.